Astrobiologist Kevin Hand prepares to deploy a rover beneath the ice of Alaska's Sukok Lake. When a probe finally reaches Europa, its search for life may be modeled on trial runs like this. And with the powerful SLS rocket NASA is designing, he says, "we could potentially get to Jupiter and Europa very quickly." An electronic signal travels from NASA's Jet Propulsion Lab in Pasadena, California, to a robotic rover clinging to the underside of foot-thick ice on an Alaskan lake. The rover's spotlight begins to glow. "It worked!" exclaims John Leichty, a young JPL engineer huddled in a tent on the lake ice nearby. It may not sound like a technological tour de force, but this could be the first small step toward the exploration of a distant moon. More than 4,000 miles to the south, geomicro­biologist Penelope Boston sloshes through murky, calf-deep water in a pitch-dark cavern in Mexico, more than 50 feet underground. Like the other scientists with her, Boston wears an industrial-strength respirator and carries a canister of spare air to cope with the poisonous hydrogen sulfide and carbon monoxide gases that frequently permeate the cave. The rushing water around her feet is laced with sulfuric acid. Suddenly her headlamp illuminates an elongated droplet of thick, semitransparent fluid oozing from the chalky, crumbling wall. "Isn't it cute?" she exclaims. These two sites—a frozen Arctic lake and a to­xic tropical cave—could provide clues to one of the oldest, most compelling mysteries on Earth: Is there life beyond our planet? Life on other worlds, whether in our own solar system or orbiting distant stars, might well have to survive in ice-covered oceans, like those on Jupiter's moon Europa, or in sealed, gas-filled caves, which could be plentiful on Mars. If you can figure out how to isolate and identify life-forms that thrive in similarly extreme surroundings on Earth, you're a step ahead in searching for life elsewhere. 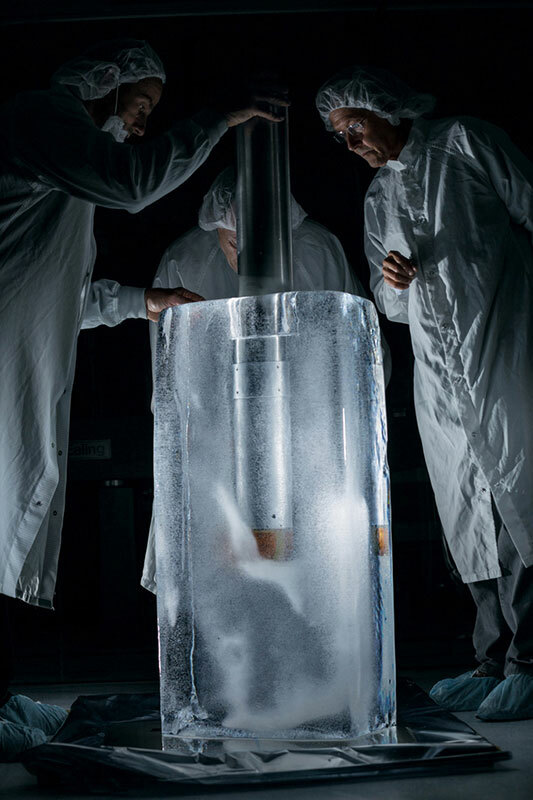 Scientists at NASA's Jet Propulsion Laboratory (JPL) inspect a probe like one that might someday travel beneath the ice of Jupiter's moon Europa. It's difficult to pin down when the search for life among the stars morphed from science fiction to science, but one key milestone was an astronomy meeting in November 1961. It was organized by Frank Drake, a young radio astro­nomer who was intrigued with the idea of searching for alien radio transmissions. When he called the meeting, the search for extraterrestrial intelligence, or SETI, "was essentially taboo in astronomy," Drake, now 84, remembers. But with his lab director's blessing, he brought in a handful of astronomers, chemists, biologists, and engineers, including a young planetary scientist named Carl Sagan, to discuss what is now called astrobiology, the science of life beyond Earth. In particular, Drake wanted some expert help in deciding how sensible it might be to devote significant radio telescope time to listening for alien broadcasts and what might be the most promising way to search. How many civilizations might reasonably be out there? he wondered. So before his guests arrived, he scribbled an equation on the blackboard. Astronomer Frank Drake helped found the science of astrobiology in the 1960s by searching for radio broadcasts from alien civilizations. Now 84, he's got a new target: flashes from alien light sources. "We know how to do SETI much better these days," he says. "Our biggest challenge is coming up with the funding." The final step: Multiply the number of radio-savvy civilizations by the average time they're likely to keep broadcasting or even to survive. If such advanced societies typically blow themselves up in a nuclear holocaust just a few dec­ades after developing radio technology, for example, there would probably be very few to listen for at any given time. The equation made perfect sense, but there was one problem. Nobody had a clue what any of those fractions or numbers were, except for the very first variable in the equation: the formation rate of sunlike stars. The rest was pure guesswork. If SETI scientists managed to snag an extraterrestrial radio signal, of course, these uncertainties wouldn't matter. But until that happened, experts on every item in the Drake equation would have to try to fill it in by nailing down the numbers—by finding the occurrence rate for planets around sunlike stars or by trying to solve the mystery of how life took root on Earth. It would be a third of a century before scientists could even begin to put rough estimates into the equation. In 1995 Michel Mayor and Didier Queloz of the University of Geneva detected the first planet orbiting a sunlike star outside our solar system. That world, known as 51 Pegasi b, about 50 light-years from Earth, is a huge, gaseous blob about half the size of Jupiter, with an orbit so tight that its "year" is only four days long and its surface temperature close to 2000°F. None of these planets is an exact match for Earth, but scientists are confident they'll find one that is before too long. Based on the discoveries of somewhat larger planets made to date, astronomers recently calculated that more than a fifth of stars like the sun harbor habitable, Earthlike planets. Statistically speaking, the nearest one could be a mere 12 light-years away, which is practically next door in cosmic terms. That's good news for astrobiologists. But in recent years planet hunters have realized that there's no reason to limit their search to stars just like our sun. "When I was in high school," says David Charbonneau, an astronomer at Harvard, "we were taught that Earth orbits an average star. But that's a lie." In fact, about 80 percent of the stars in the Milky Way are small, cool, dim, reddish bodies known as M dwarfs. If an Earthlike planet circled an M dwarf at the right distance—it would have to be closer in than the Earth is to our sun to avoid being too cold—it could provide a place where life could gain a foothold just as easily as on an Earthlike planet orbiting a sunlike star. Moreover, scientists now believe a planet doesn't have to be the same size as Earth to be habitable. "If you ask me," says Dimitar Sasselov, another Harvard astronomer, "anywhere from one to five Earth masses is ideal." In short, the variety of habitable planets and the stars they might orbit is likely to be far greater than what Drake and his fellow conferees conservatively assumed at that meeting back in 1961. That's not all: It turns out that the range of temperatures and chemical environments where extremophilic organisms might be able to thrive is also greater than anyone at Drake's meeting could have imagined. In the 1970s oceanographers such as National Geographic Explorer-in-Residence Robert Ballard discovered superheated gushers, known as hydrothermal vents, nourishing a rich ecosystem of bacteria. Feasting on hydrogen sulfide and other chemicals dissolved in the water, these microbes in turn feed higher organisms. Scientists have also found life-forms that flourish in hot springs, in frigid lakes thousands of feet below the surface of the Antarctic ice sheet, in highly acidic or highly alkaline or extremely salty or radioactive locations, and even in minute cracks in solid rock a mile or more underground. "On Earth these are niche environments," says Lisa Kaltenegger, who holds joint appointments at Harvard and the Max Planck Institute for Astronomy in Heidelberg, Germany. "But on another planet you can easily envision that they could be dominant scenarios." The one factor that biologists argue is critical for life as we know it is water in liquid form—a powerful solvent capable of transporting dissolved nutrients to all parts of an organism. In our own solar system we've known since the Mariner 9 Mars orbiter mission in 1971 that water once likely flowed freely on the red planet. So life might have existed there, at least in microbial form—and it's plausible that remnants of that life could still endure underground, where liquid water may linger. Jupiter's moon Europa also shows cracks in its relatively young, ice-covered surface—evidence that beneath the ice lies an ocean of liquid water. At a half billion miles or so from the sun, Europa's water should be frozen solid. But this moon is constantly flexing under the tidal push and pull of Jupiter and several of its other moons, generating heat that could keep the water below liquid. In theory, life could exist in that water too. In 2005 NASA's Cassini spacecraft spotted jets of water erupting from Saturn's moon Enceladus; subsequent measurements by the spacecraft reported in April of this year confirm an underground source of water on that moon as well. Scientists still don't know how much water might be under Enceladus's icy shell, however, or whether it's been liquid long enough to permit life to exist. The surface of Titan, Saturn's largest moon, has rivers, lakes, and rain. But Titan's meteorological cycle is based on liquid hydrocarbons such as methane and ethane, not water. Something might be alive there, but what it would be like is very hard to guess. Mars is far more Earthlike, and far closer, than any of these distant moons. The search for life has driven virtually every mission to the red planet. The NASA rover Curiosity is currently exploring Gale crater, where a huge lake sat billions of years ago and where it's now clear that the chemical environment would have been hospitable to microbes, if they existed. 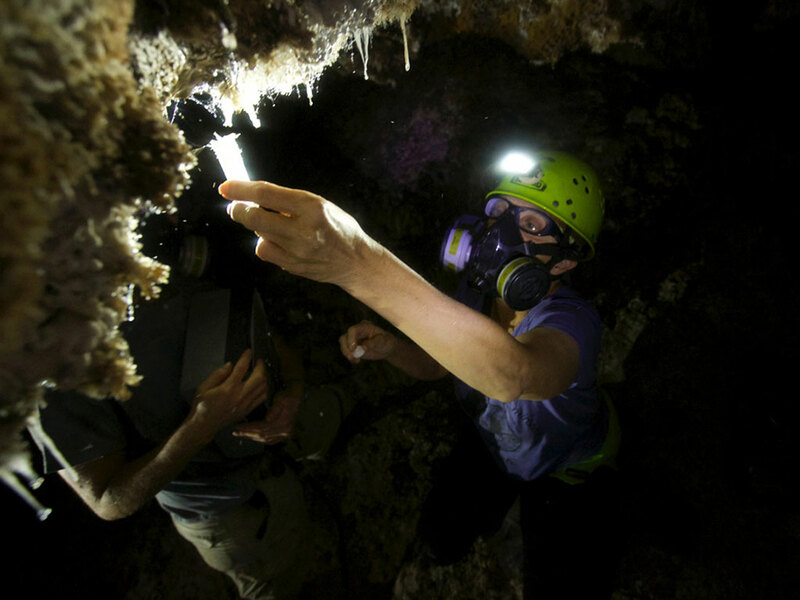 Penelope Boston of the New Mexico Institute of Mining and Technology and the National Cave and Karst Research Institute captures a drop of bio­film from the Cueva de Villa Luz ("cave of the lighted house") in Mexico. 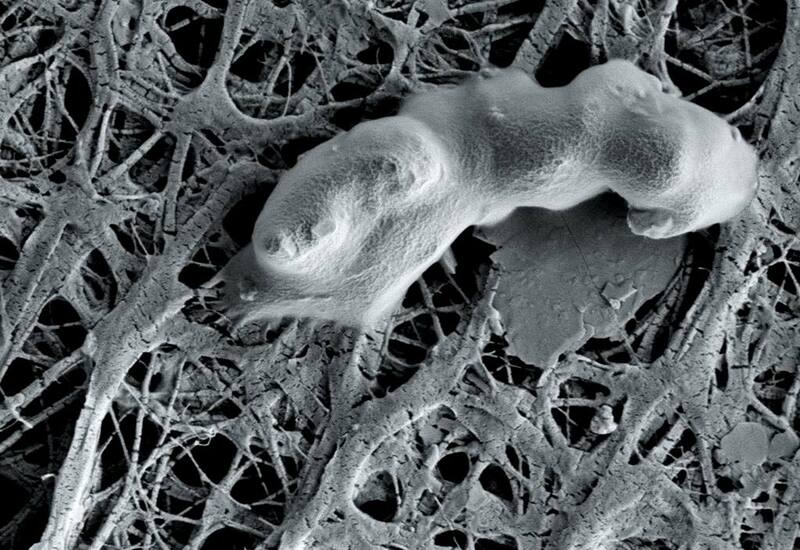 The viscous goo—dubbed a snottite—harbors bacteria that derive energy from hydrogen sulfide within the toxic cave. Life-forms in such extreme ecosystems serve as earthly analogues for organisms that might thrive in extraterrestrial environments. A cave in Mexico isn't Mars, of course, and a lake in northern Alaska isn't Europa. But it's the search for extraterrestrial life that has taken JPL astrobiologist Kevin Hand and the other members of his team, including John Leichty, to Sukok Lake, 20 miles from Barrow, Alaska. The same quest has lured Penelope Boston and her colleagues multiple times to the poisonous Cueva de Villa Luz, a cave near Tapijulapa in Mexico. Both sites let the researchers test new techniques for searching for life in environments that are at least broadly similar to what space probes might encounter. In particular, they're looking for biosignatures—­visual or chemical clues that signal the presence of life, past or present, in places where scientists won't have the luxury of doing sophisticated laboratory experiments. Take the Mexican cave. Orbiting spacecraft have shown that caves do exist on Mars, and they're just the sorts of places where microbes might have taken refuge when the planet lost its atmosphere and surface water some three billion years ago. Such Martian cave dwellers would have had to survive on an energy source other than sunlight—like the dripping ooze that has Boston so enchanted. The scientists refer to these unlovely droplets as "snottites." One of thousands in the cave, varying in length from a fraction of an inch to a couple of feet, it does look uncannily like mucus. It's actually a biofilm, a community of microbes bound together in a viscous, gooey blob. The snottite microbes are chemotrophs, Boston explains. "They oxidize hydrogen sulfide—­that's their only energy source—and they produce this goo as part of their lifestyle." Snottites are just one of the microbial communities that exist here. Boston, of the New Mexico Institute of Mining and Technology and the National Cave and Karst Research Institute, says that all told there are about a dozen communities of microbes in the cave. "Each one has a very distinct physical appearance. Each one is tapping into different nutrient systems." One of these communities is especially intriguing to Boston and her colleagues. It doesn't form drips or blobs but instead makes patterns on the cave walls, including spots, lines, and even networks of lines that look almost like hieroglyphics. Astrobiologists have come to call these patterns biovermiculations, or bioverms for short, from the word "vermiculation," meaning decorated with "irregular patterns of lines, as though made by worm tracks." It turns out that patterns like these aren't made only by microorganisms growing on cave walls. "It happens on a variety of different scales, usually in places where some resource is in short supply," says Keith Schubert, a Baylor University engineer who specializes in imaging systems and who came to Cueva de Villa Luz to set up cameras for long-term monitoring inside the cave. Grasses and trees in arid regions create bioverm patterns as well, says Schubert. So do soil crusts, which are communities of bacteria, mosses, and lichens that cover the ground in deserts. If this hypothesis holds up—and it's still only a hypothesis—then Boston, Schubert, and other scientists who are documenting bioverms may have found something crucially important. Until now, many of the markers of life astrobiologists have looked for are gases, like oxygen, that are given off by organisms on Earth. But life that produces an oxygen biosignature may be only one kind among many. "What excites me about bioverms," says Boston, "is that we've seen them at all these different scales and in all these wildly different environments, and yet the characters of the patterns are very similar." It's highly plausible, she and Schubert believe, that these patterns, based on simple rules of growth and competition for resources, could be literally a universal signature of life. In caves, moreover, even when the microbial communities die, they leave the patterns behind. If a rover should see something like this on the wall of a Martian cave, says Schubert, "it could direct you where to focus your attention." At the opposite end of North America, the scientists and engineers shivering at Sukok Lake are on a similar mission. They're working at two different locations on the lake, one next to a cluster of three small tents the scientists have dubbed "Nasaville," and the other, with just a single tent, about a half mile away as the crow flies. Because methane gas bubbling from the lake bottom churns up the water, ice has a hard time forming in some places. To snowmobile from one camp to the other, the scientists have to take a curving, indirect route to avoid a potentially fatal dunking. It was the methane that first drew the scientists to Sukok and other nearby Alaska lakes back in 2009. This common hydrocarbon gas is generated by microbes, known collectively as methanogens, that decompose organic matter, making it another potential biosignature astrobiologists could look for on other worlds. But methane also comes from volcanic eruptions and other nonbiological sources, and it forms naturally in the atmosphere of giant planets like Jupiter as well as on Saturn's moon Titan. So it's crucial that scientists be able to distinguish biological methane from its nonbiological cousin. If you're focused on ice-covered Europa, as Kevin Hand is, ice-covered, methane-rich Sukok Lake isn't a bad place to get your feet wet—as long as you don't do it literally. Hand, a National Geographic emerging explorer, favors Europa over Mars as a place to do astrobiology, for one key reason. Suppose we do go to Mars, he says, and find living organisms in the subsurface that are DNA based, like life on Earth. That could mean that DNA is a universal molecule of life, which is certainly possible. But it could also mean that life on Earth and life on Mars share a common origin. We know for certain that rocks blasted off the surface of Mars by asteroid impacts have ended up on Earth. It's also likely that Earth rocks have traveled to Mars. If living microbes were trapped inside such spacefaring rocks and survived the journey, which is at least plausible, they could have seeded whichever planet they ended up on. "If life on Mars were found to be DNA based," says Hand, "I think we would have some confusion as to whether or not that was a separate origin of DNA." But Europa is vastly farther away. If life were found there, it would point to a second, independent origin—even if it were DNA based. Europa certainly seems to have the basic ingredients for life. Liquid water is abundant, and the ocean floor may also have hydrothermal vents, similar to Earth's, that could provide nutrients for any life that might exist there. Up at the surface, comets periodically crash into Europa, depositing organic chemicals that might also serve as the building blocks of life. Particles from Jupiter's radiation belts split apart the hydrogen and oxygen that makes up the ice, forming a whole suite of molecules that living organisms could use to metabolize chemical nutrients from the vents. The big unknown is how those chemicals could make it all the way down through the ice, which is probably 10 to 15 miles thick. The Voyager and Galileo missions made it clear, however, that the ice is riddled with cracks. Early in 2013 Hand and Caltech astronomer Mike Brown used the Keck II telescope to show that salts from Europa's ocean were likely making their way to the surface, possibly through some of those cracks. And late in 2013 another team of observers, using the Hubble Space Telescope, reported plumes of liquid water spraying from Europa's south pole. Europa's ice is evidently not impenetrable. All told, Pappalardo says, the redesigned mission should come in at under two billion dollars over its whole life span. If the mission concept goes forward, he says, "we envision a launch sometime in the early to mid 2020s." If that launch takes place aboard an ­Atlas V rocket, the trip to Europa will take about six years. "But it's also possible," he says, "that we could launch on the new SLS, the Space Launch System, that NASA is currently developing. It's a big rocket, and with that we could get there in 2.7 years." The Clipper likely wouldn't be able to find life on Europa, but it could help make the case for a follow-up lander that could dig into the surface, studying its chemistry the way rovers have studied Mars's. The Clipper could also scout out the best places for such a lander to set down. The next logical step after a lander—sending a probe down to explore Europa's ocean—could be a lot tougher, depending on how thick the ice is. As an alternative, mission scientists might try to reach a lake that may be entirely contained within the ice near the surface. "When that undersea explorer eventually does come to fruition," says Hand, "in evolutionary terms, it'll be like Homo sapiens to the Australopithecus we've been testing in Alaska." The relatively crude rover Hand and his crew are testing at Sukok Lake crawls along under a foot of ice, its built-in buoyancy keeping it firmly pressed against the frozen subsurface, sensors measuring the temperature, salinity, pH, and other characteristics of the water. It doesn't look for organisms directly, however; that's currently the job of the scientists working on another aspect of Hand's project across the lake, including John Priscu of Montana State University, who last year extracted living bacteria from Lake Whillans, half a mile under the West Antarctic ice sheet. Along with geobiologist Alison Murray, of the Desert Research Institute in Reno, Nevada, and her graduate student Paula Matheus-Carnevali, Priscu is investigating what characteristics frigid environments need to make them friendly to life and what sorts of organisms actually live there. Some astrobiologists are even investigating a possibility that sounds more like science fiction than science. All of the focus on biosignatures and extremophiles assumes that life on other worlds, like life on Earth, will be built from complex molecules that incorporate carbon as an essential part of their structures—and use water as a solvent. One reason is that carbon and water are abundant throughout the Milky Way. Another is that we don't know how to look for noncarbon life, since we don't know what biosignatures it might leave. "If we limit our search this way, we could fail," says Harvard's Sasselov. "We need to make an effort to understand at least some of the alternatives and what their atmospheric signatures might be." So Sasselov's group at Harvard is looking at alternate biologies that could plausibly exist on distant worlds, where, for instance, a sulfur cycle might replace the carbon cycle that dominates terrestrial biology. In the background of all this research is the project that got astrobiology started more than half a century ago. Although he's technically retired, Frank Drake is still looking for extraterrestrial signals—a discovery that would trump everything else. Though Drake is frustrated that the funding for SETI has mostly dried up, he's excited about a brand-new project that would try to detect flashes of light, rather than radio transmissions, from alien civilizations. "It's wise to try every possible approach," he says, "because we're not very good at psyching out what extraterrestrials might actually be doing." Michael Lemonick's latest book is Mirror Earth: The Search for Our Planet's Twin. Mark Thiessen shot our story on the solar system in the July 2013 issue. Society Grant: Penelope Boston's research was funded in part by your Society membership. Europa's frozen fissured surface, seen here in a colorized moasic image from the Galileo spacecraft, hides a liquid ocean that may hold all the ingredients needed for life. Of the 1,780 confirmed planets beyond our solar system, as many as 16 are located in their star's habitable zone, where conditions are neither too hot nor too cold to support life.